Game story and narrative are one of the most important aspects of modern game design. Story is used in nearly all modern games in some context; originally inspired by narrative structures and concepts used in film and books, it has flourished into many different forms while developers try to strike a balance between great gameplay and an immersive story. 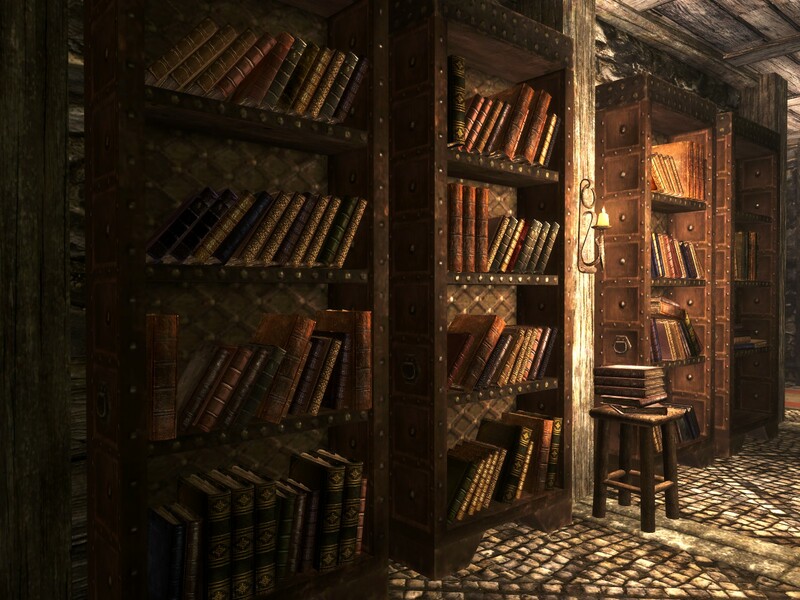 In this blog post I touch upon some key aspects of game narrative and where they have come from, some approaches used in modern games and I create some comparisons between some story-heavy games I have played recently. Game story – Where does it come from? Games back in the 1970s and early 80s were focused around pure gameplay; Pong (1972) for example didn’t have a story about a renegade endlessly running between two opposing space factions, it was just a game where you bat a pixel to score points. This started to change over the next few years. Space Invaders (1978) was the first to demonstrate narrative, it was a game which became a killer app for the Atari 2600 and catapulted the video game industry into the mainstream. It was the first game supported with a basic narrative which placed the player in control of protecting the earth from invading aliens. Donkey Kong (1981) though emphasized the story even more, with a narrative based on a three act structure and defined characters such as a hero, a damsel in distress and a menacing antagonist. In Donkey Kong, the player (named Jumpman) has to rescue his lover Paulina from the clutches of his pet ape Donkey Kong who has climbed to the top of the scaffolding. This characterization was pushed through the game graphics, each character had a distinct design that allowed for instant recognition. Donkey Kong himself for instance appeared large, angry and intimidating making him easily identifiable as the antagonist. This tradition of characterization and a focused story continued to be built upon in games like Super Mario Bros (1985) and The Legend Of Zelda (1986) and has laid the foundations of modern game storytelling. A few years later adventure games began to become into focus, with elements inspired from board games, text-based PC adventures and live action roleplaying making their transition into video games. This marked the rise of the role playing game which made a focus on gaining items, completing quests and interacting with numerous NPCs. Some of these mechanics were initially touched upon in The Legend Of Zelda but were pushed further in games like Final Fantasy (1987) where these elements were used heavily to expand on the main plot. Developments continued into the 90s where video game budgets inflated incredibly allowing for more Blockbuster-type scope in terms of storytelling. Two huge examples of this during this period are Final Fantasy VII (1997) and Metal Gear Solid (1998) which use elaborate prerendered cutscenes to establish important plot elements. These games had a huge focus on fixed plot material and were very influential in terms of a more movie like approach to game story. 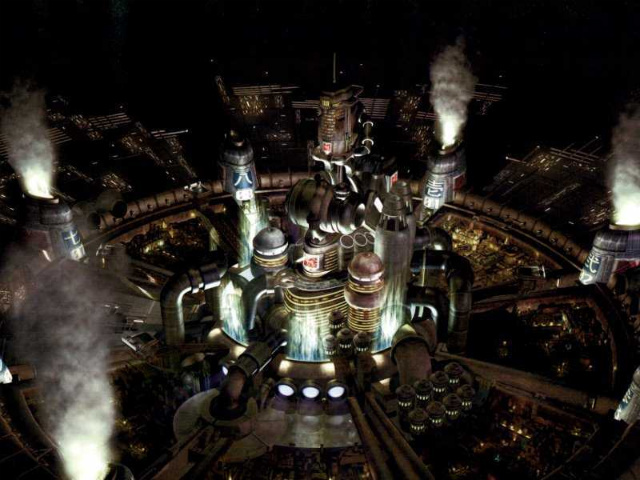 Cutscene from Final Fantasy VII, an inflated budget allowed for a scope never before seen in a video game. Open world games also developed alongside the more cinematic approach, games like Grand Theft Auto III (2001) and Bethesda’s Elder Scrolls series (1994 onwards) focused on a more flexible narrative allowing players to completely abandon the main story if they wanted, complete quests or missions in any order they like or just free roam in the world. This allowed the player to create their own story as they go, something reminiscent of the Choose Your Own Adventure books of the 80s. To gather some material for this research I started to play some story-heavy games including Heavy Rain (2010), Metal Gear Solid and The Last Of Us (2013) as well as games like Journey and Shadow Of The Colossus which don't rely as much on dialogue but still have an interesting narrative. All of these games I never played before so it was a fun and interesting experience in learning all of the interesting narrative mechanics in each. I also did some research into how story is actually constructed in games and come across some very interesting reads. One point that emerges is that game story and narrative has become less linear as video games has developed, this attributes more to the rise of open world games and stories that results in alternate endings or plotlines. Also games have become less focused on a rigid plotline as game designers have realised that players remember the characters more rather than the individual plot elements, this allows for more immersion in the game and leaves things up for interpretation more, something which allows for a different kind of story telling compared to movies or television. Here I compare two games I played (ahem* researched) Metal Gear Solid and The Last Of Us, both are regarded as having some of the best game story of their respective time. Metal Gear's story is very rigid in nature, not allowing for a lot of deviation in the plot more akin to a movie, there is also a heavy focus on advancing the story through long cutscenes which can take the player out of the experience. exposition compared to many of today's games. The Last Of Us still has the occasional cutscene but the bulk of the narrative is done through in game characterization rather than driven purely through cutscenes. There is also a difference in story structure between the two games as Metal Gear is more based upon a three-act narrative structure typically found in movies, however The Last Of Us is more serialized where the overall arc is separated into smaller individual stories like television series. The serialized approach allows characterization to shine through more as the in game objectives become more focused on more short term goals. Where to next for game narrative? The most successful games at the moment seem to be the ones that leave a lot up to the imagination. Great examples of this can be seen in games like Journey (2012) and Limbo (2010), in the former example the lack of dialogue and text leaves much to be interpreted by the player, leaving the weight of the story to be carried on sound and fantastic visuals. This creates more of an experience than just using exposition, really pulling the player into the world. 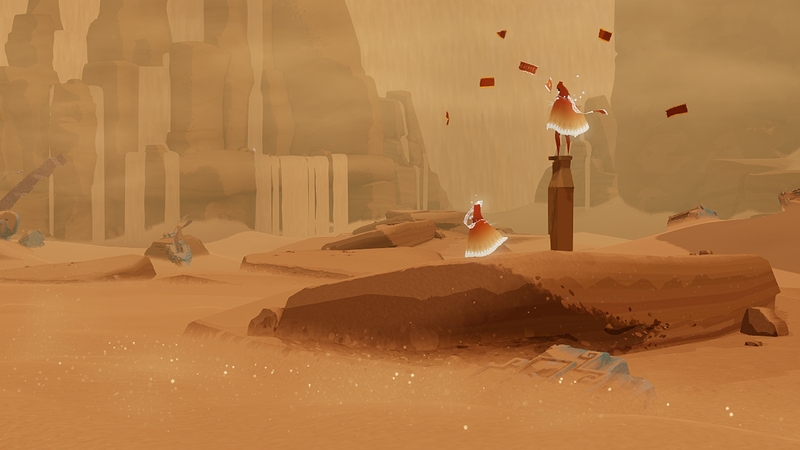 Journey is a fantastic example on how visuals and sound can carry the weight of a story rather than using words. 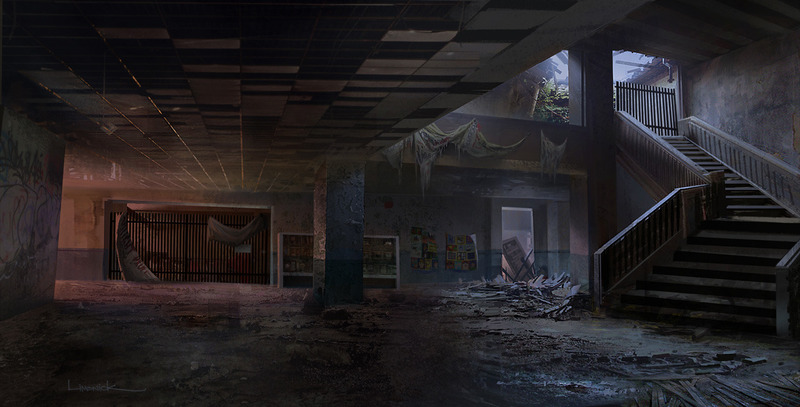 This is starting to work its way in to triple A productions, games like The Last Of Us leave some plot elements to be interpreted from the world. I think this trend will continue into future games as lot more games seem to be popping up with a less of a reliance on overly-structured plotlines. On the other hand games like Beyond Two Souls (2013) and Telltale games explore different avenues. With the former continuing the cinematic linearity focus of Quantic Dream’s previous games, while the latter uses an episodic story approach as found on television shows within a point and click game context. All these approaches have one thing in common, they are trying to bridge the gap between gameplay and story. This has been something designers have been focusing on for a while now and are coming closer to achieving; a focus on characters rather than plot, communicating narrative through the game world while still keeping a sense of freedom and exploration will drive the next generation of video games stories. Please enter an author. (Please enter a date of publication). IMDb. [Online]. [Accessed 27 April 2014].